This chasm walk is not for the feint hearted but is a lot of fun for those up for a bit of an adventure! The chasm is now only accessible via a farm trailer ride which you need to prebook (a couple of days before should be fine during school holidays). This ride takes about 30 minutes and will drop you and up to 20 others at the start of a bush walk. This is easy to follow with clear markers and a printed sheet of info to help you. 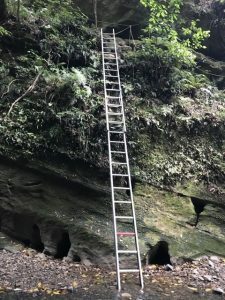 A couple of sections have ropes which you can use to hold on to but for the most part, it’s a gently undulating route with varied native plants and trees along the way. The track is following the river but apart from one short section, you’re high above the water and can only hear it. Points of interest, like Wave Rock, are noted in the written info and make for good breaks and perhaps for a bit of a geography lesson if your kids are interested! The 3km bush walk ends with some ropes and an 8 metre ladder down into the river. If you suffer from vertigo, you might have problems but while it might look precarious, it is actually straight forward to navigate, even for kids. 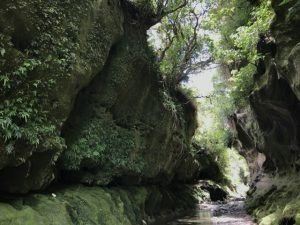 The river walk starts off going upstream for 150m to see the Moss Umbrella Falls and generally get a first taste of the chasm and walking through the river. Again, the route is marked with clear flags or pegs and detailed descriptions on the info sheet. At times, the river is quite deep but there is always an alternative route either on the riverbank or switching to the other side of the river where it’ll be shallower. The rocks can be extremely slippy and it’s good to have your hands free for this section, so you can use them to steady yourself as required. The scenery is amazing but hard to capture in photos! It will possibly be like nothing else your family has ever seen before. Again the geography lesson can continue with some stalactites and areas of fossilised shells in the rock. The latter can lead to discussions about how come there are shells in these rocks when they’re so far from the sea! The riverwalk is approximately 3km but will probably take longer than the bush walk due to navigating through the water and stopping to admire the scenery. The water is cold so it’s definitely an advantage if you can go on a day when the air temperature is warm. Wearing swimming togs and/or quick drying clothes is also a good option – you will all get wet at some point even if you walk in the shallowest part of the river! You might see eels in the deeper water, so look out for them. The farmer will return to collect the group 3 hours after he dropped you off which is plenty of time to complete the roughly 6km. Wear closed shoes that you don’t mind getting completely wet. Have a spare set of clothes either in your car or leave at the start of the walk for when you’re waiting for your return ride. Take lunch and water. Either leave some/all of the food at the start of the walk for when you’re waiting for your return ride or take it with you to enjoy when you’re having a rest. 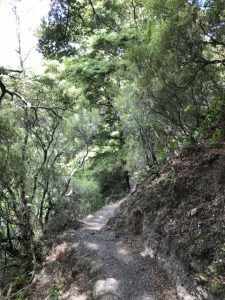 The chasm and bush walk are mostly sheltered from the sun but you should still take hats and sunblock for the trailer ride and the parts that aren’t sheltered. Don’t rush the walk – 3 hours is plenty of time even for the slowest of walkers and the farmer won’t leave you behind! Address: Patuna Farm, Haurangi Road, approximately 20 minutes drive from Martinborough. Open: from early November (coinciding with Toast Martinborough) and closing early April. 2 groups a day at 10.30 and 11.30am with more added if there’s demand. Operates everyday during the season except Christmas Day and New Years Day. Arrive 10 minutes before to complete health and safety paperwork. Cost: the ride costs Adults $25, Kids $10, payable in cash only to the farmer.